This Admiration canola frying oil is just what your commercial kitchen needs! Canola oil's reputation as a nutritious oil has created high demand. It contains the least saturated fat of all cooking oils, and it's trans fat and cholesterol free! 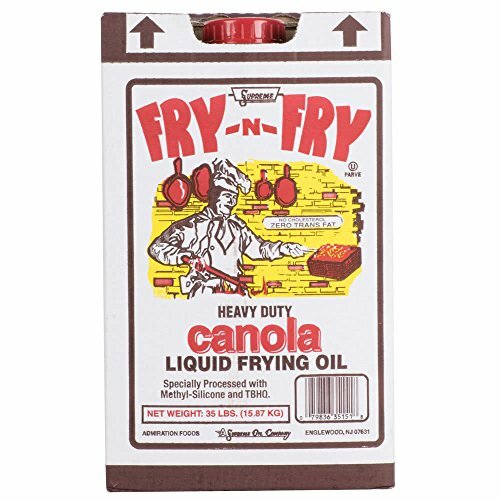 Popular and versatile, this canola frying oil is an excellent multi-purpose ingredient for any venue, and this 35 lb. bulk container will keep your establishment in good supply. Extracted from harvested canola seeds, this canola frying oil has a golden yellow color and smooth texture. Its neutral taste and high heat tolerance make it the perfect oil for deep frying. Serve up batches of french fries, chicken wings, and more using Admiration canola frying oil, and satisfy all of your hungry customers!